The rapid implosion of the high-profile TBD news site is further evidence that hyperlocal journalism is more hype than hope for the news business. Launched with considerable fanfare and generous funding only six months ago by Allbritton Communications, TBD was the latest effort in the nation’s capital to create websites filled with intensely local coverage that, it was hoped, would attract large and loyal followings. Instead, they cost a bundle and withered for lack of interest. Prior to TBD, whose staff and mission will be scaled back in, fittingly, a to-be-determined fashion, the two most prominent hyperlocal experiments in the District were Backfence, a pioneering start-up that succumbed in 2007, and Loudon Extra, a lavish two-year effort unsuccessfully underwritten by the Washington Post that folded in 2009. TBD faltered for the same four reasons its esteemed predecessors could not get off the ground. For the record, these are the same reasons that most ill-conceived media start-ups fail. :: Small audiences – The thesis underlying all hyperlocal efforts is that a sufficiently large number of individuals in a narrowly targeted geography will be captivated by the information the site provides about their community as to become avid readers of it. Intuitively, this makes perfect sense. Practically, there is not that much compelling news about the average community in the average month. If consumers have a limited amount of time to spend perusing the news, they are more likely to gravitate to such really big stories as what’s happening in Libya or the endlessly fascinating life of Justin Bieber. In any event, eyeballs – and lots of them – are the essential ingredient for every media venture. As the Washington Post and Allbritton Communications learned, it is at once difficult and expensive for even start-ups backed by wealthy media companies to coalesce a sufficiently large critical mass of readers in a tiny geographic area. :: Big expenses – A quality news report requires feet on the street. Compelling web and mobile sites require sophisticated technical platforms. Audience development requires marketers equipped with adequate marketing budgets. And hyperlocal ad sales – especially among local dry cleaners and orthodontists – requires lots of people spending lots of time calling on prospects with very small (or often nonexistent) advertising budgets. All of this costs money – and lots of it, if you want to do things right. And cheaping out is a recipe for failure. :: Small revenues – Because backfill banner ads for dubious weight-loss products yield little more than $1 per thousand views, serious hyperlocal publishers have to hire the aforementioned high-priced ad staffs to try to monetize the traffic they are fortunate enough to attract. Because hyperlocal sites for the most part have intimate audiences, they can only sell sponsorships for a few hundred dollars apiece. Unfortunately, the low yields barely cover the cost of the sales effort – much less all the other expenses enumerated above. :: Big losses – High costs and low revenues add up, of course, to big losses. At some point, the losses become too onerous to bear and you get what happened at Backfence, Loudon Extra and TBD. The setback at TBD will not spell the end of the hyperlocal experiment. AOL this year is spending $50 million to fund the roll-out Patch.Com in dozens of communities across the land. Will Patch be the one to break the hyperlocal barrier? TBD. There is no logical reason for the federal government to continue funding public broadcasting. Fortunately, public broadcasters can afford to tell the feds to get lost. Thanks to nearly $9 billion of sometimes-grudging federal support since 1969, public radio and television have become mature, powerful and self-sustaining businesses. While I cherish This American Life and the PBS NewsHour as much as the next guy, continued public funding for this select group of non-profit media companies is unnecessary and unsustainable at a time when government at every level is cutting support for desperately needed health, education and welfare programs. 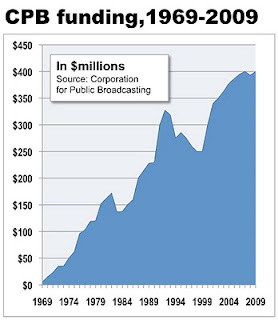 In a reprise of a theme that’s almost as old as the history of federally subsidized broadcasting in the United States, Republicans in the House are trying to kill some $400 million in annual appropriations for the Corporation for Public Broadcasting, which has distributed a total of $8.85 billion in federal funding since 1969 to the Public Broadcasting System and National Public Radio. The ups and occasional downs in that annual funding are illustrated at left. Although the loss of federal largesse initially would stress the nation’s 368 public television stations and 934 public radio outlets, these generally well-funded, well-known and well-established organizations for the most part could carry on, because only 15% of their backing on average comes from Uncle Sam. While an instant 15% drop in revenues would ruin anyone’s day, it pales against, say, the nearly 50% plunge that newspapers have suffered in ad sales in the last five years. So, yes, public broadcasters would have to retrench. Yes, they would have to step up fund-raising from foundations, from corporations and from listeners and viewers like us. And, yes, that would mean more pledge breaks. But it would be worth it, because public broadcasters would gain the independence they – and viewers and listeners like us – deserve. Once and for all, the broadcasters could concentrate on broadcasting, instead of worrying about the next budgetary challenge from Capitol Hill or the White House. 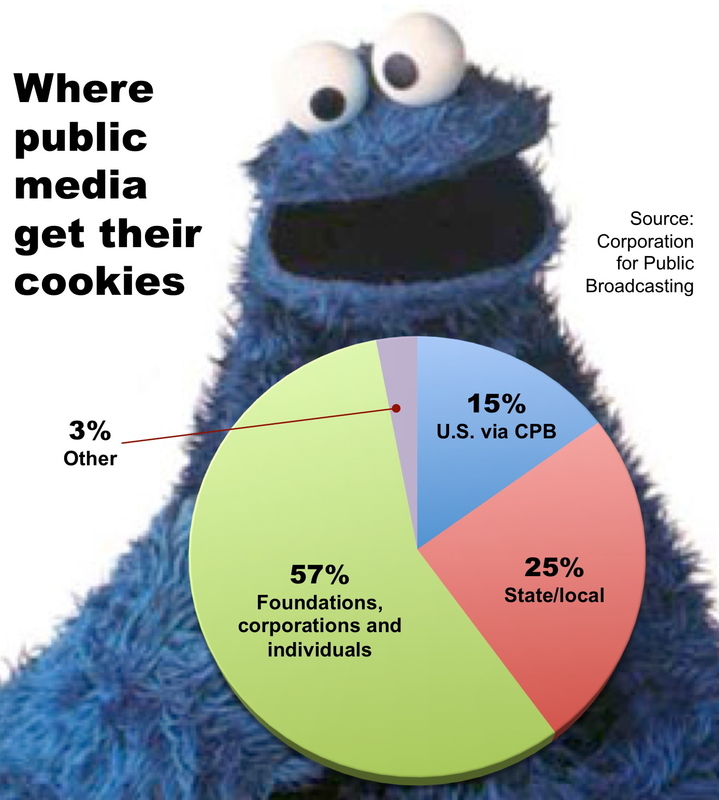 Given the bold, powerful and valuable journalism often produced by the public media, CPB has been caught in multiple political crossfires from the time it was established in 1967 as a federally funded but non-government organization with non-profit status. Its news coverage, budget and management have come under attack from the administrations of Richard M. Nixon, Ronald W. Reagan and George W. Bush, not to mention legislators on both sides of the aisle in Congress. As detailed in an excellent history of CPB at Funding Universe.Com, Nixon challenged its news coverage, Reagan slashed its budget and Bush installed a number of highly politicized executives at CPB in an effort to combat what was regarded as liberal bias on the public airwaves. CPB hasn’t only been criticized from the right. Lawmakers spanked it in the 1970s for a lack of programming for racial and ethnic minorities and for employing only two non-white individuals among its top 29 managers. Despite periodic political strafing and occasional budgetary setbacks, CPB grew formidably over the years. From a modest $5 million federal grubstake in 1969, the annual budget for CPB rose to $476.8 million in 2009, according to its tax return. Adjusted for inflation, the original $5 million is equal to a shade less than $29 million in 2009 dollars. Thus, the budget of the organization in four decades has grown by some 1500%, or three times faster than the rate of inflation in the the same period. Although CPB distributes 95% of its budget to its broadcast affiliates, the organization reports that it spent $21.8 million to fund its own operations in 2009, including the compensation of a dozen executives whose pay ranged from $200,000 to $369,514 per year. Beyond the brass at CPB, dozens of additional executives enjoy comp that runs well into the six figures at NPR, PBS and many local affiliates. The president of PBS, to pick one example, made more than $632k in 2008, according to the organization’s tax return. As big as federal backing of CPB has become, the organization provides only about 15% of the budget for the typical NPR or PBS affiliate, according to the corporation. As illustrated below, 57% of the funding for public broadcasting in 2009 came from foundations, corporations and individual donors. 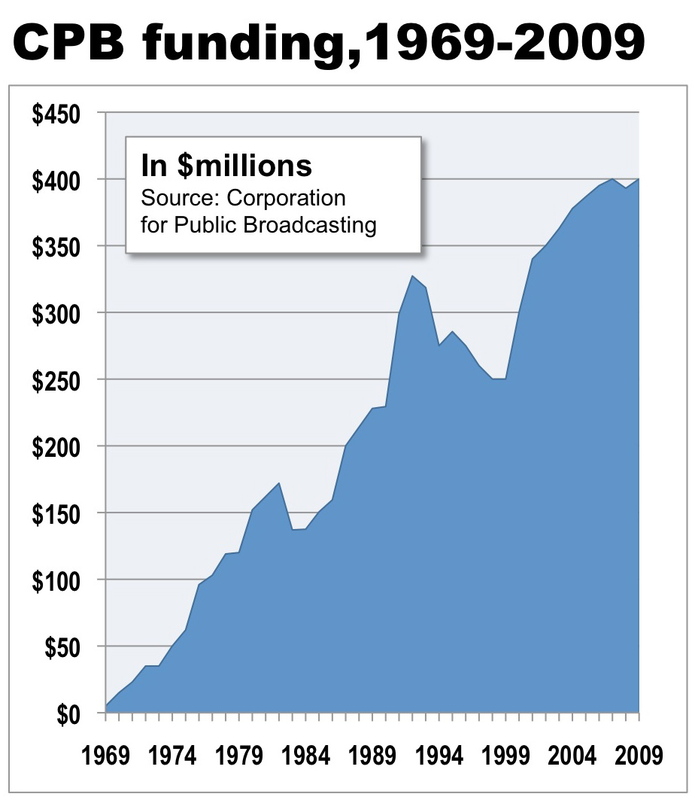 In 2009, the private funding supporting public broadcasting totaled $1.5 billion, proving rather convincingly that the public media have the fund-raising infrastructure and skills to sustain themselves. The other large chunk of funding for public media ($655.7 million, or about 25%) comes from state and local government, including tax-supported educational institutions with radio and TV operations. With fiscal stress not confined to the federal government, some of this funding admittedly also could be imperiled. In that event, public broadcasters will have to respond by finding new revenues or tightening their belts – just like everyone else. The fact that the public media operate with only a modest degree of federal funding is not only fortunate for them at a time of aggressive budget cutting but also a sign that government support of the public media has been an unqualified success. When Congress first enabled the CPB, the idea was to foster an alternative to commercial programming that was famously characterized as a “vast wasteland” in 1961 by Newton Minow, who at the time was chairman of the Federal Communications Commission. Although commercial TV is vaster and waste-ier today than it was back then, the public media successfully leveraged their federal seed money to build perhaps stronger and healthier organizations than the founders and their funders had dared to imagine. In an advertising campaign seeking to drum up support for continued federal funding of the public media, the industry argues forcefully that its audience consists of 170 million Americans, or an impressive 56% of the population. At a time when health, welfare and education programs are being slashed and burned at the federal, state and local levels, it is illogical, if not to say offensive, to argue that the large and well-heeled public broadcasting infrastructure needs government help more than hungry children, ailing seniors and unemployed people freezing in their homes. Of course, society cannot live alone on decent nutrition, proper health care and comfortable shelter – though you sure miss them when you don’t have them. To the degree there is public or charitable money to spend on intellectual nourishment, sophisticated entertainment and enterprising journalism, it makes sense in these straitened times to spread the support as widely as we possibly can. If the feds are to continue any funding whatsoever for non-profit media, then let’s give all non-profit news ventures – from New America Media to MinnPost to Lexington Commons – an equal chance to compete for the sort of seed money that helped build public broadcasting into the powerful organization it is today. If the feds completely turn off the spigot, then all non-profit media are going to have to compete among themselves for support from foundations, corporations and individuals. It won’t be a fair fight, because the public broadcasters already have a formidable head start among all non-profit media. But, at least, they won’t have the unfair advantage they long have enjoyed of access to Uncle Sam’s checkbook. It’s rare when the sharpest marketer in Silicon Valley stumbles, but Google scooped Apple by introducing a subscription service that hits the sweet spot for publishers. Just one day after Apple unveiled a gotcha-laden iTunes subscription service for publishers of newspapers, magazines and other media, Google yesterday stepped forward with a competing system that presciently obviates the most troublesome shortcomings of Apple’s plan. Coincidence? Perhaps. But impressive nonetheless. Like the Apple plan, the new Google system, which is called One Pass (not to be confused with the Continental Airlines frequent-flier program of the same name), allows publishers to sell subscriptions for any price and any duration. Complete control of their product offerings, a direct connection with their subscribers and a far bigger share of the revenues than Apple has proposed. :: While the Apple system works with iPhone and iPad apps downloaded from iTunes, Google says its service will work on any web or mobile platform, so long as the mobile platform permits “transactions to take place outside of the app market.” The quote is a not-so-subtle dig at the walled garden Apple has put around its mobile apps but it also exposes the biggest potential drawback in the Google plan, which is that Apple may block the use of the Google system on its products. :: While a subscription acquired through Apple will be valid only within the carefully circumscribed Apple ecosystem, a subscription acquired on One Pass will be recognized at a any digital destination a user happens to go. If you sign up for One Pass at Website A, you can use the same account to purchase access to Mobile App B. In other words, you need only one account, one user name and one password. :: While Apple puts itself in the position of having the primary relationship with the subscriber, One Pass puts itself in the background and lets the publisher communicate directly with the sub. Apple will let consumers voluntarily disclose their names and email addresses to a publisher, but the opt-in approach a major drawback for newspapers and magazines that need to know the identity of the people they count in their circulation audits. :: While Apple seeks 30% of the transaction in most circumstances, Google is taking only a 10% cut. How could Apple have stumbled so badly? In a word, hubris. Evidently beguiled by the steady stream of successful high-tech confections it has produced, Apple seems to have gotten the impression it can call all the shots. Although many publishers are peeved at Apple, it may not be too late for this abundantly creative company to craft a more palatable solution. After all, these are the folks who turned the ugly-duckling Newton into the soaring swan we know as the iPhone. Regardless of how the Silicon Valley sumo match plays out, the biggest problem the publishers and the tech giants face is whether a substantial market for paid content will emerge at all. As discussed here, there are powerful reasons to wonder how much content can be corralled inside a pay wall after ranging freely on the web for more than 1½ decades. While the new iTunes subscription service for publishers may inspire more efforts than ever to charge for content, it won’t put a dent in the overwhelming consumption of free news on the Internet. The Apple subscription service unveiled yesterday intends to do for publishers of newspapers, magazines and other media what iTunes did for music: Create an attractive, convenient, one-click environment for buying all manner of digital media. But the service is not going to throttle the flow of free news on the web any better than iTunes has stopped the torrential consumption of pirated music. The truth is that no one knows exactly how much music is stolen over the Internet. However, the International Federation of the Phonographic Industry, a content cop for the music industry, said in 2009 that no less than 95% of the music consumed on the web is ripped off. Despite the surge by more than 1000% in the digital music market from 2004 to 2010 to an estimated value of US$4.6 billion, global recorded music revenues declined by 31% over the same period. The two figures powerfully illustrate how, in the face of piracy, even the most progressive strategy of licensing hundreds of digital music services has been unable to prevent the steady decline in the over-all legitimate music market. :: Unlike a one-of-a-kind recording by a particular artist, news is a commodity that is neither unique nor proprietary. There is no singular and un-emulatable rendition of any international, national, financial, entertainment or other type of news story. Anyone with an iPhone can take a picture, shoot a video or write a story for the world to see. Because no one owns any news event, no one can own an account of it. :: News loses its exclusivity the moment it is reported. The legal principle of fair use makes it possible for anyone to reference and/or excerpt a reasonable portion of a news article. Although copyright laws make it a crime to copy and distribute intellectual property in its entirety without authorization, the laws so far have done nothing to stop the wholesale trafficking in illegal music. With news harder to protect than an original recording, how can any publisher hope to do better that the recording industry? :: Information will find its away around any obstacle. The Internet is a highly redundant, self-healing network that originally was designed to assure the flow of information would not interrupted in the event any node in the system were destroyed in a nuclear attack. As sturdy as the network is, the individuals who use it are even tougher. Publishers in an open society like ours can never hope to thwart those who are intent on liberating their content. :: The biggest reason most content will remain free is that there is no universal desire among news producers to charge for it. Except for some individual artists and few renegade record labels, almost everyone in the music business has been and remains committed to stamping out music piracy. This decidedly is not the case when it comes to news. Thousands of great and small news sites are explicitly organized to give away content for free to build page views on which they can sell advertising. As but one example, a major component of the inflated $315 million value of Huffington Post is its skill at building a growing audience by aggregating content from other websites. The best a publisher can hope to do with iTunes or any other system is to capture payments from the relatively small number of individuals who are too busy, too oblivious or too ethical to pay for content instead of scrounging it for free. This is not to say newspapers and other publishers don’t deserve to be compensated for the investment they make in reporting the news. But the reality that publishers have to accept is that the marketplace is bigger than they are. Theoretically, it is possible for publishers to hang on to 100% of their revenues when they sell subscriptions through a new service launched today at the Apple iTunes Store. Realistically, however, publishers are more likely to continue forking over 30% of most of their sales to the House that Jobs Built. Accordingly, the House in most cases will continue to win. This entirely unsurprising prospect results from a close reading of the brief announcement that Apple is offering a new subscription service at the iTunes Store to publishers of newspapers, magazines, audio and video. For content producers eager to get paid for producing new iPhone and iPad apps, this announcement may be enough to encourage them to take the plunge. But the brief press release describing the program contains some significant drawbacks for publishers. 1. The service will let publishers set the price and the length of a subscription (from a week to a year). 2. Registered customers can buy a subscription through their iTunes account with one click. 3. Apple gets 30% of the revenues for every subscription bought at iTunes but publishers can keep 100% of the revenue for any subscription they sell on their own sites. 4. The publisher gets to know the name and email address of the customer only if said customer elects through the app to provide it to the publisher. :: While Apple will let publishers keep 100% of revenues if customers buy subscriptions on the publisher’s website (see No. 3 above), the reality is that most people will continue buying subscriptions through the app. This means Apple will continue in most cases to get a 30% cut of most subscription revenues. Faced with years of sagging readership, Newspapers changed their circulation rules last year to make it possible for them to take credit for subscribers on every print and electronic platform. If publishers cannot identify their iApp customers, it will be difficult, if not impossible, to prove their cross-media reach to advertisers. Though the new Apple system is capable of putting some welcome change into the piggybanks of participating content producers, the new system appears to leave publishers at a distinct disadvantage to the House. Which clearly is how the House likes it. We already knew mobile phones were a big thing but who knew the power they had to turbo-charge the growth of digital media that got their start on the desktop? Though Meeker’s primary job nowadays is picking promising companies to back, she also continues to track the rise of what she and her new boss, managing partner John Doerr, call the SoLoMo (Social/Local/Mobile) Media. As Meeker shows in this must-see presentation , the growth of the SoLoMo Media has been anything but slow-mo. :: Facebook – The number of individuals downloading the Facebook mobile app increased 300% to 200 million since September, 2009. Mobile Facebookers are twice as active as desktop users. :: eBay – Sales volume at the mobile portal of the shopping service tripled to nearly $2 billion in 2010 and is expected to double in 2011, according to John Donahoe, the chief executive. :: Twitter – Half of all active users on Twitter are using its mobile platform. Mobile tweeters also are 40% more active than those parked in front of laptops or PCs. :: Shazam – A service that magically identifies a song after hearing a few bars of it, Shazam doubled its mobile base to 100 million users in 12 months. :: Pandora – The custom radio service reports that 50% of the 3 million users it adds each month are coming through its mobile app. :: Spotify – The European music-delivery company found that users of its mobile app are twice as likely to upgrade to its paid service than those who access it via computer. As each of these companies has found, the key to a successful mobile strategy is to be compelling, customizable, viral, transactional and fun. But you knew that. The late but not necessarily lamented 2010 was supposed to be the Year of the Pay Wall for newspapers. But consumers overwhelmingly repudiated the efforts of the few publishers who dared to demand payment for access to the news, leaving newspaper content about as widely and freely available on the web at year's end as it had been for the prior decade and a half. Because hope springs eternal among profit-challenged newspaper publishers, they are not giving up. Many have plans for 2011 to introduce what I would call Pay Speed Bumps. While these efforts may be slightly more successful than Pay Walls, they are being launched in an environment in which plenty of competitors -- TV broadcasters, Patch.Com and local start-ups, to name a few -- will be perfectly happy to deliver the news of the day for free. So, publishers planning speed bumps will have to engineer them wisely. Speed bumps, as everyone knows, are irritating obstacles in the road that cause you to slow down or risk shaking a few fillings out of your molars. They don't keep you from getting where you want to go. They just make the trip slightly slower and less pleasant. And, if you are anything like me, they encourage you to look for an alternate route. Speed bumps are exactly like the complicated new approaches that publishers have concocted to try to get paid for the stories they port from their papers to the digital media. These complex plans are bound to confound consumers as never before, raising the question of whether the consternation and ill will they engender will be worth the modest revenue they bring in. Life would have been simpler for publishers if they had been able to erect monolithic pay walls to force visitors to ante up for online access to the news. But consumers, who have been hooked for the better part of a generation on unencumbered access to news, music, video and other content, failed to cooperate. As revealed in this survey of pay walls at three dozen newspapers by Belden Interactive, fewer than 1% of consumers on average were willing to subscribe. 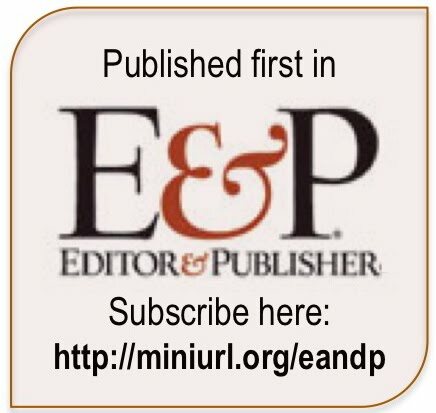 After experiencing alarming drops in readership at their websites, papers in places like Harlingen, TX, and Sonoma, CA, quickly restored free access to their sites. With pay walls off the table, publishers now are moving toward hybrid systems that will let them charge some kinds of fees for some kinds of content under certain kinds of circumstances. Consumers will have to be smart and diligent enough to figure out how they work. :: Metered Sites. As soon to be typified by the New York Times, this approach allows a site visitor a certain number of free views but then requires her to buy a subscription after the limit is reached. The number of free views can be changed dynamically, so the newspaper can generate as many page views as it needs to maximize ad sales. Although publishers may understand the rules of their schemes perfectly well, consumers may become frustrated by the unpredictability of whether and how often they can read the news. How many will give up in favor of the myriad alternative free news sites? :: Hybrid Sites. Some content will be free and some will cost money at the web and mobile sites of the Dallas Morning News. Which is which? "Subscriber content will include proprietary news and information produced by The News," says the paper. "Headlines, breaking news, most blogs, obituaries, classifieds and nonproprietary content such as syndicated wire stories will remain free." While publishers may know the difference between proprietary and nonproprietary content, this sounds like the recipe for the sort of confusion that could cause a consumer to look elsewhere. :: Dueling Sites. The Boston Globe, which for years has put the contents of the flagship newspaper on Boston.Com for free, has split its web presence in two, keeping Boston.Com free but charging for access to a new site called BostonGlobe.Com. The free site will include only headlines and bulletins (not whole stories) from the flagship paper, augmented by content from other sources. Visitors who pay for BostonGlobe.Com will have access to the full paper. While this approach cuts the straightest corners of the three, it depends on consumers understanding the difference between the two sites, their willingness to toggle between them -- and their enthusiasm for paying for content that used be free and may turn up elsewhere at no charge. You can't fault newspapers for wanting to be paid for their valuable content, but each of these approaches seems to be far more publisher-friendly than consumer-friendly. Given the openness and competitiveness of the web, the danger in these speed bump-inspired schemes is that they may encourage consumers to forsake newspaper sites for ones where the news is simply, and mercifully, free. While journalists and other media types like to think professionally produced content is king, our friends in the financial community apparently don’t agree. Recent deals like the Facebook financing, the Demand Media IPO and the Huffington Post sale show that investors put far more value on companies aggregating cheap or free content than on dedicating generous resources to original, high-quality journalism. There are several reasons for this, as discussed in a moment. First, let’s look at the huge difference between the value of a digital superstar spending absolutely nothing on content and a struggling legacy media company still employing a small army of reasonably well paid professional journalists. The companies are Facebook, which needs no further introduction, and McClatchy, the largest publicly held pure-play newspaper publisher in the land. Although there are many ways to value a company, one of the quickest and easiest is to divide the value of its stock by its sales. So, that is what we’ll do. Facebook, which had an estimated $2 billion in sales in 2010, was valued at $50 billion earlier this year in a private financing, or fully 25 times its sales. By contrast, McClatchy, whose sales were almost $1.4 billion in 2010, had a market capitalization at the close of trading yesterday of just $372.1 million, or a mere 0.30x of its revenues. The divergent market momentum of the two companies explains the sharp disparity in their valuations. Users and traffic have been growing so rapidly at Facebook in the last couple of years that the site now surpasses all others in the amount of time users linger at it. Facebook accounted for 12.3% of the time spent online in the U.S. in 2010 vs. 7.2 % in the prior year, according to a study released yesterday by ComScore, the audience-measuring service. More visitors spending more time at Facebook create a perfect environment for the targeted keyword advertising the company sells on its pages. Best of all, Facebook’s ads are sold through a do-it-yourself system, meaning that the company spends no money on producing content or selling ads. This is a recipe for highly efficient growth and profitability, so long as Facebook doesn’t someday fall out of consumer favor like the formerly high-flying MySpace. While Facebook has been dazzling the media world, McClatchy’s world has been rocked by the secular collapse of the newspaper industry. After peaking at $2.3 billion in 2007, McClatchy’s revenues fell to $1.4 billion in 2010. Its net profit last year slid a vertiginous 33.4% from the prior year to 43 cents a share. McClatchy also is burdened by nearly $1.8 billion of the debt it incurred to purchase of the Knight Ridder newspaper chain in 2006, the year the wheels started coming off the once-indomitable newspaper business. The high debt burden contributes to the low esteem in which the company is held on Wall Street. 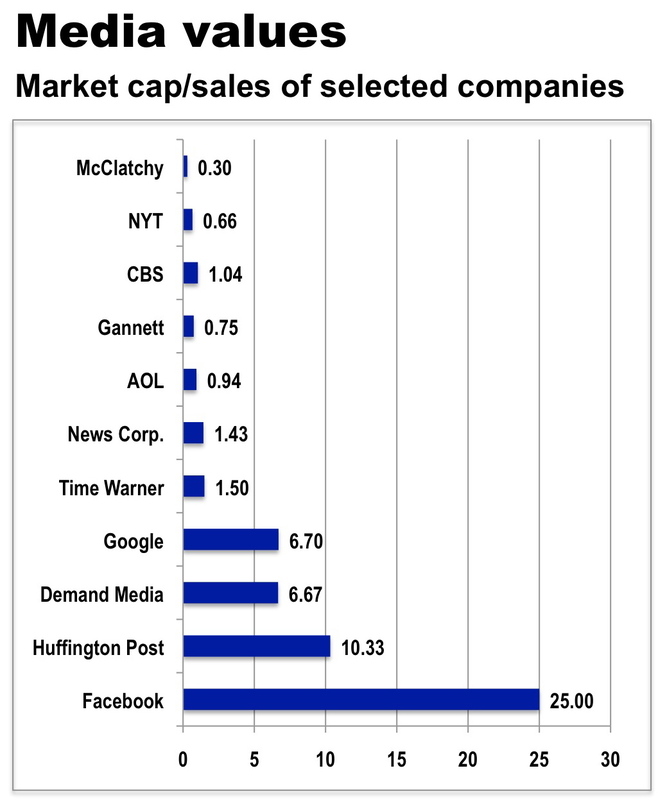 As you can see from the table below, the mismatch between the valuations of Facebook and McClatchy is evident among several other media players, too. Old media companies – the ones who continue to invest in content – are valued at no greater than 1.5x revenues, because financiers consider their future business prospects to be unclear (or, worse) in the digital age. New media companies, on the other hand, are regarded as potentially capable of the dramatic growth epitomized by Facebook. Google, which brilliantly scrapes and organizes everything on the web but decided against creating content of its own, is valued at 6.70 times its sales. Were Google not as large and mature as it is today, it probably would carry an even higher valuation. The valuation of Demand Media, which began trading publicly last month, is almost identical to Google’s. Demand Media generally pays freelancers $10 per article to write stories of little journalistic import that are designed, instead, to build traffic and fetch advertising dollars on sites like eHow and Cracked. 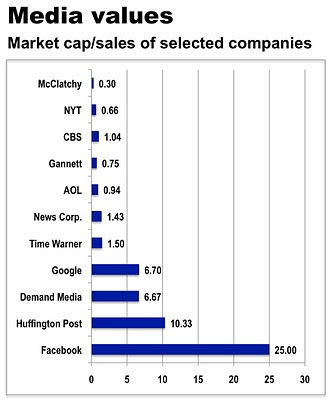 Huffington Post was valued at a steep 10.33 times sales when AOL purchased the company this week. Although HuffPo publishes some original articles by a few properly compensated writers, its ad-based business model relies heavily on contributions from some 6,000 unpaid bloggers and the aggressive aggregation of articles cribbed from other prominent websites, including many who still spend money on journalism. Creative and prosperous as the digital publishers may be, they aren’t doing much to afflict the comfortable and comfort the afflicted. But investors, at the moment, seem to love them more than the publishers who do. AOL overpaid for HuffPo. Can deal pan out? AOL is vastly overpaying for Huffington Post from a strict financial point of view. So, the big question is: Will this deal ever make financial sense? A once-massive Internet service provider that is struggling to turn itself into a content powerhouse, AOL is paying $315 million for HuffPo, or approximately 10 times the reported HuffPo sales of $31 million in 2010. With the stock of AOL trading at a bit under 1x its revenues for the last 12 months, Arianne Huffington and her fellow owners will get a 10x larger share of AOL than HuffPo’s sales would have contributed to AOL in 2010. Financial analysts call this a dilutive transaction, because it transfers value away from the rest of the stockholders and delivers it to the owners of the acquired company. From a strict financial point of view, therefore, AOL significantly overpaid for HuffPo. With approximately 3.7 times more web traffic than HuffPo’s 13.4 million monthly unique visitors, AOL can steer additional traffic to HuffPo from a wide array of sites ranging from Patch.Com to TechCrunch to Moviefone. The graphic below from HuffPo illustrates the vision for the combined companies. AOL also has a far larger ad sales operation than HuffPo, which ought to be able to surpass the $50 million to $60 million in revenues that HuffPo likely would have achieved this year if it remained a free-standing company. If HuffPo’s revenues triple this year to $90 million, then Armstrong can tell his shareholders he paid “only” 3.5x more for HuffPo than its sales are worth. If HuffPo sales triple again to $270 million in 2012, then the value of the deal is likely to be about 1x HuffPo’s revenues at that point and Armstrong, assuming he remains on the job, can tell the skeptics he was right. The question to ask yourself in evaluating the long-term financial benefit of the acquisition to AOL is whether you think HuffPo is capable of bringing in a $270 million in annual sales within a couple of years. Do you? Although The Daily may lack journalistic and intellectual heft, don’t sell it short: This revolutionary app is a living, breathing glimpse into what digitally delivered news, entertainment and advertising will look like in the future. Dramatic display. The Daily takes full advantage of the iPad’s ability to handsomely render rich media on a large, high-resolution screen. The cover of Friday’s edition stunningly featured a 360-degree view of Tharir Square in Cairo, which began panning as soon as the page was launched. Every issue features photo galleries that appear when the tablet is turned in a horizontal direction. The Daily is the real deal when it comes to high-tech eye candy. Concise storytelling. The Daily has disciplined itself to hold stories to a screen or two, packing as much punch as possible into every paragraph. Even though reading a book on the iPad can be pleasant for as long as your upper-body strength holds out, those publishing news for the digital media need to respect the limited time and attention span possessed by the typical info-overloaded consumer. Long-form programming is best left to the legacy print and broadcast media. Shoveling those formats onto the iPad is an unnatural act that will turn off most consumers. 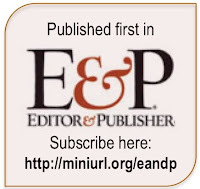 The Daily is differentiated from the legacy publishers because it is a digital native. Rich-media integration. The Daily fully leverages the storytelling power and emotional impact of video, audio, photos and graphics. This is not to say that the implementation is perfect. Technical gremlins trip up the daily download of the app and often freeze and pixellate videos as they are playing. Some of the videos seem forced, off-point or just, plain dubious. In the latter case, a video of Rep. Gabrielle Gifford was promoted in a way that suggested it was produced since she was shot, rather than recycled from a filming that took place prior to the Tucson tragedy. Audio clips add texture and verisimilitude to the coverage and a slick recording format in the comments section lets visitors literally voice their opinions. Photos and graphics are bold, creative and help tell stories without the proverbial thousands of words. Notwithstanding the missteps described above, The Daily has the power to take rich media to the next level. Interactive advertising. Ads don’t just look good in The Daily. They come alive. Best of all for advertisers and motivated consumers, the iPad makes it possible to connect immediately (assuming the stuttering AT&T network cooperates). Big buttons on the Macy’s ad in The Daily help readers click and buy at the department store’s website, download its iPad app or become a follower at its Facebook and Twitter pages. If instant gratification is the future for consumers and marketers, then The Daily is pretty, darn gratifying. The sad part of the story is that the creators of The Daily evidently got so caught up in building a dazzling technical platform that their editorial platform became an afterthought. As noted previously here, the journalism is too lightweight to substitute for the New York Times or CNN, the news is too generic to satisfy consumers of local print or broadcast media, and the 99-cent weekly tab is too high for devotees of such free products as TMZ and Entertainment Tonight. Thus, serious questions remain about whether The Daily can attract a sufficiently large audience of paying customers to achieve commercial viability. Shortcomings aside, The Daily stands as a gift and a challenge to the media industry. It’s a gift, because Rupert Murdoch generously is sponsoring an eight-figure science fair experiment to stretch the boundaries of this important new publishing genre. And it is a challenge, because The Daily has stepped up the expectations for digital publishing. Those who are not prepared to compete will be left behind. The Daily debut flops: What went wrong? The inaugural edition of The Daily was a dud. Unless it suddenly gets a whole lot better, we all can save the 99 cents it hopes to collect each week from subscribers. The Daily debuted yesterday as the first scratch-built news publication for the iPad. But the initial edition of the long-awaited News Corp. project, which consisted of the barest possible news report backfilled by a bunch of vapid features, shockingly failed to live up to the ambitious mission it set for itself. “It’s underwhelming,” said a friend paging with me through the new app for the first time. I couldn’t put it better myself. Once The Daily was installed, I discovered that the day’s “news” report – which was not updated 12 hours after being introduced with great fanfare at mid-day in New York – was exactly four stories deep. From that inauspicious start, it was off to the really soft stuff, like a not-very-gossipy gossip piece on Natalie Portman, a yawner titled “Rihanna Who?” and the world premier of a game called “Oregon Trail,” which appears to be a cross between Farm Ville and Frontier Ville – as if we needed another one of those. The lack of intellectual heft makes The Daily feel more like the Etch A Sketch edition of Us Magazine than the ground-breaking news platform it purports to be. It was not all bleak. The pluses for the app included the ability to customize the sports section to feature your favorite teams, handsome picture galleries that switched on when the iPad was tilted to the horizontal position and a slick Macy’s ad that linked to the department store’s website, iPad app, Facebook page and Twitter feed. Not even the appealing technological touches, however, made up for the weak and confusing mix of content. So, what were they thinking at News Corp., where Rupert Murdoch reportedly earmarked $30 million to bring this project to market? If The Daily is going after the New York Times/Huffington Post/CNN crowd, it fails for want of deep, broad, timely and authoritative content. If it is going after the Miami Herald/Minneapolis Star Tribune/ Portland Oregonian crowd, it fails for want of local news, local flavor and local advertising. If it is going after the New York Post/TMZ/Entertainment Tonight crowd, it is too tame, too wordy and too expensive to compete at even 99 cents a year. As the producers of the Broadway version of “Spiderman” will tell you, it sometimes takes a while to get the kinks out of a new creative undertaking. So, The Daily may yet rebound. Still, it is hard to understand how News Corp. – with all the global cross-media resources at its command – stumbled so badly on opening day. Is there a news doctor in the house?